Selling Phone Dials on CL and getting scammed! I had posted an ad on CL to sell my 15" phone dials and tires. Got a an email response from a buyer that wanted them in the worst way and would send a check the following day and arrange pick up...cool! Fast forward...few days later he tells me that his secretary send a check for $2,950 by mistake, but all I needed to do was cash the check and deduct the cost of the wheels, add $50 for my efforts. Mail Gram back the balance. This is a scam! I called his bank once I got the check. The bank knew all about this guy. His company is called Eastside Entertainment. Anyone interested in a set of "15" Phone Dials with new tires? That happened on Craig's list ????? What is the world coming to.....so just for clarification how much did you want for the wheels not that I need them. Very common scam. You send him balance of his money back, his check later bounces, you're out what you sent him. Congrats on your first scam trophy! Mount it proudly on your wall, and start collecting others. and that you need a postal money order for the correct amount. I emailed him and told him that I spoke with his bank in Ill and they agreed to release funds. I thanked him for buying a set a 15" phone dials for $2950. Delivery is still extra and he needs someone to come and pick them up. I have pinned the check to my office wall. I want $300 for the wheels and tires. I think it's fair price. The tires are like new and they clean an in my garage. Not that many heat cycles thru them and have hardly seen the light of day. what are the rim widths and offset on them? 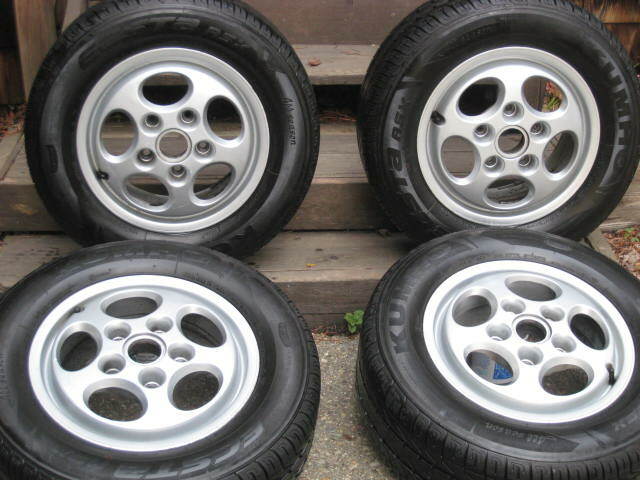 been thinking of getting a set of 15" for my 911 track car. Those scammers sent me 3 $3000 "cashiers checks" for a $200 set of cocoa mats for a BMW X3. I took the checks to my bank and ask the teller to verify the checks before depositing, the bank they were written on had no record of the check numbers so I gave the checks and copies of the emails to my local police to put in their files. Sent the buyer an email telling them my bank refused to cash the checks and that any form of payment they sent would have to clear my bank before I sent them anything. Never heard back. On the bright side told the story to my dentist whom informed my she had just bought an X3 and took the cocoa mats in trade for the bridge I was in getting.